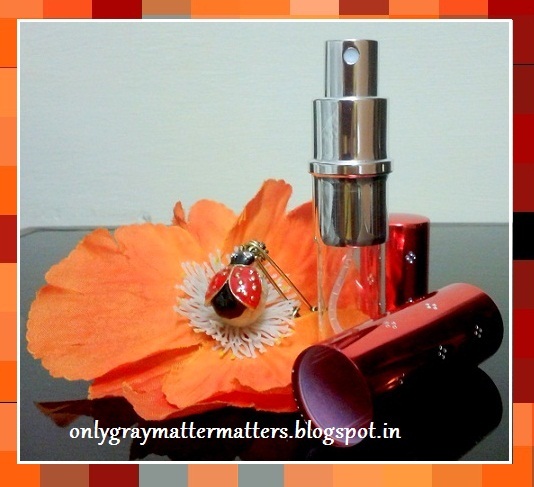 Today I am going to review the perfume atomizer spray bottle I had bought from buyincoins.com. You can see my haul HERE. I first got to know about atomizers from Urbantouch.com around 1.5 years ago. It was offering a Basicare atomizer for INR 350 at that time, which sounded a bit pricey. But when I had tried to place an order, my transaction did not go through. So this was always on my wishlist. When I recently found affordable atomizers at buyincoins.com, I squealed with joy. 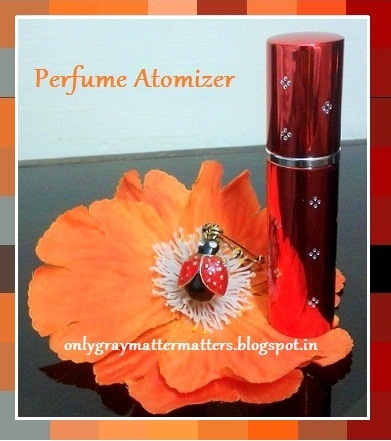 I bought this perfume atomizer for $1.74 minus 5% discount. Which comes to around INR 92, at a conversion rate of INR 56 per US$ (because Paypal charges you a little higher than market rate). I just noticed buyincoins.com keeps changing prices and this one is now available for $1.53 minus 5% discount if you use 'Gaganpreet' as recommender code while signing up. You can buy this particular model HERE. For other designs, just search for 'atomizer' in the buyincoins.com search box. There are a few more variations of atomizers available at buyincoins.com. I liked this one. On taking it out of the bubble wrap, I could not pull the glass bottle out of the frame even after several tries and for a moment, my heart sank. Then I went back to buyincoins.com and checked the pictures. Then I retried slowly and it finally came out. This bottle has a metallic frame. 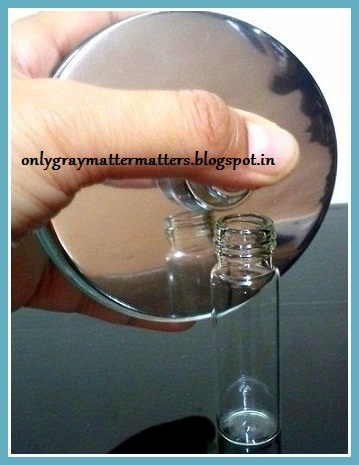 You need to pull out the inner glass bottle and unscrew the lid. The outer covering protects the delicate inner glass bottle from damage and also protects the perfume's quality by saving it from high temperature. You can use it for its primary purpose - to carry your favorite perfumes while travelling, without having to carry around bulky glass perfume bottles. I have explained below how to do that. It comes very handy for using perfume samples (samples come in small glass bottles without any spray nozzle) you may have received from some perfume store or during some promotion. You can transfer your cologne or aftershave to this atomizer bottle and spray it instead of dabbing it. It can also be used for ittars, which you can easily transfer to the bottle by pouring directly, and easier as compared to transferring perfumes. You can use this bottle for eye wash. I fill it with water and use it for washing my eyes. The spray from this atomizer is very gentle, it's a spritz. So after makeup removal, I fill it with filtered RO water and spray into my eyes. It thoroughly washes my eyes and any residual makeup comes out of the tear duct. It is a great thing to use in the summers, to refresh your eyes from heat. I found this as the best use for myself. You can fill it with your favorite facial mist or rose water and carry it around in your purse or pocket. Then whenever you need to refresh your face, simply spray the facial mist or rose water on your face for a beautiful refreshing experience. You can even spray cold water on your face, after returning home from a tiring day in dirt and pollution. This helps the water or mist reach deep within your skin and hydrates the skin immediately. You can also put your makeup remover or toner into this atomizer bottle to make use of the spray action and dispense the product easily onto a cotton ball or tissue. HOW TO TRANSFER PERFUME TO AN ATOMIZER SPRAY BOTTLE? 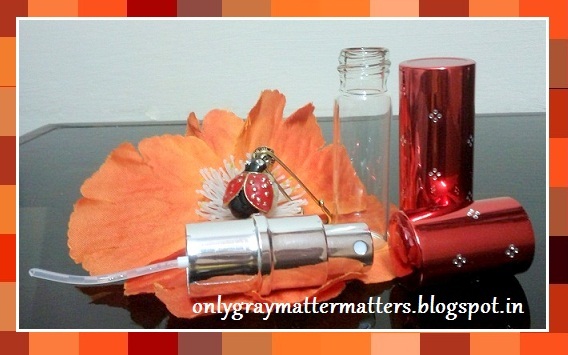 You need to quickly spray the perfume into the atomizer glass bottle. My perfume bottle was bulky, so this part was a little difficult for me. I held both of them together near my lap so any perfume that sprays out goes on to my clothes. But actually if you hold properly, there is hardly any wastage. Even though it was tricky to transfer perfume into it, there was almost zero product wastage while transferring. You just need to be careful, that's all. Available in different attractive colors and models. Makes a great and thoughtful gift for both men and women. It is a little tricky to get the perfume into the atomizer. But once done, and a little practice, it makes for a great tool to carry your fragrances along. It emits a fine mist when you use water, but when spraying perfume, you need some practice for pressing out half a pump, else you will end up with big blots of perfume on your dress and would use up a lot of your expensive perfume in one go. You can practice with a cheaper perfume first, if you are very unsure. I played around with water many times, before filling in perfume. Unless you really learn to press out very gently, it may not be suitable for ittars/attars, for which an extremely small amount is sufficient to give you a strong fragrance. It is not specified how much liquid can this model hold. You need to be quick while transfering perfume to the atomizer, else your perfume's fragrance and quality may degrade on long exposure to air. I have it but simple one..this is v pretty n loved the way how u explained diff uses of this bottle..my fav ones r use for eyes wash n spray cold water on ur face..i never tried it for both but will do it now.. Thanks for sharing gagan .. Thanks Radha :) You can by from BIC or from Healthkart.com. I didn't know that we had something like these in the market :) the bottle is very cute and sleek...i think using a dropper would make it easier to transfer the perfume without any wastage. Yes dear I also came to know a couple of years ago. You can use a small funnel to spray through but dropper seems impossible to use, since perfume bottles are sealed . So you cannot collect the perfume from the bottle with a dropper. And also even if it is possible to open the seal, the perfume will evaporate on contact with air. So you need to spray into the mouth of the bottle quickly. I think it is easier to do it with long sleek perfume bottles than the one I used. Wow fab review Gagan! Will love to buy it. Is it available anywhere on Indian online site? 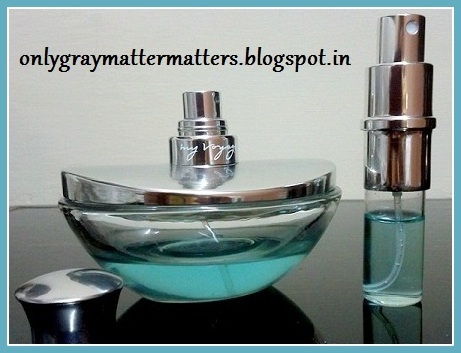 Yes Megha, you can check out the Basicare Perfume Atomizer at healthkart.com. 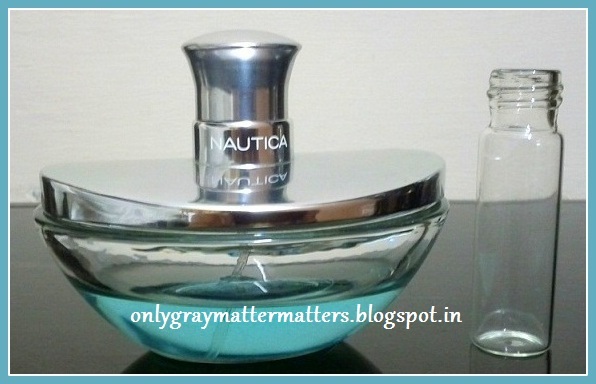 It is currently at a discounted price of INR 175 and also comes with a small funnel as I can see in the pic. Used to be for INR 350 when I had first seen it a year and half ago. Or you can check ebay too. Putting perfume in the nebulizer is a very tricky thing, I don't want to waste a drop of perfume.